The hats are part of the male typical clothing, although women also used to use it during the day when they went out to any place and the sun was very hot; such is the case when women used the “Montuna Santeña”, which is the “pollera” of task or of work. The “camisilla” is a fine shirt, which is made with linen, poplin or Dacron (the silk should not be used), with delicate tucks and buttoned up. The buttons can be golden or of gold. They are made, although less traditional, “camisillas” with “trencillas” [braids] and works of “talco” and embroidered [with openwork]. The price of the “camisilla” oscillate among $1.50 and the hat according to the works can be among $1.50 to $300.00. 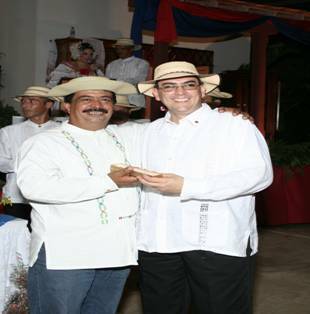 The “camisillas” and the hats are made in Tablas Abajo, Guarare, Santo Domingo, San Jose, among others. Here are 2 local Panamanians wearing the traditional camisillas. These hats are made all over the Azuero Peninsula. Almost all Panamanians have a camisillas. They are all handmade in the towns like Pedasi, Las Tablas, and Guarare. When visiting Panama a camisillas should be purchased because it is a true symbol of culture on the Azuero Peninsula and Panama.